End of January, Nina and I spent a week in California. I’ll readily admit it was a nice break from the Michigan winter. We’d both never been to either Napa or Sonoma, so we decided it was time. Me being the complete newbie to wines from that region, I relied on friends and fellow bloggers to give me some direction on which wines to try. We decided to limit it to four wineries, two in Napa and two in Sonoma. We only had the weekend, and we have by now learned that tastings usually take a while and there is nothing worse than rushing away from a tasting to make the next on time. The first thing that struck me visiting the two regions is really how much they look like other wine regions: a long, winding road in a center of a valley, with hills rising, sometimes steeper, sometimes gentler, but always surrounded by vines. There really is nothing like it, and I was not prepared for how much at home I felt immediately. And the light and slight warmth certainly helped. Ladera Vineyards was suggested by Anatoli of Talk-a-vino. He insisted one had to try their wines, and he helped us in setting up a tasting there. The first thing I had to do was google the winery (I know, shame on me). So what did I learn? 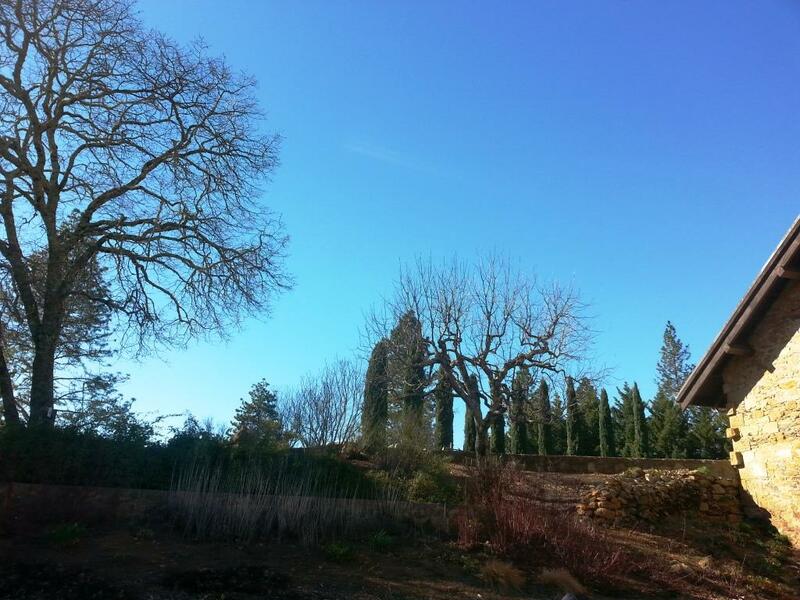 Ladera is located on Howell Mountain, one of the top spots in Napa, and its roots go back to 1886, when the first winery building was erected in that same spot it now is, with vineyards dating back to 1877 (not the vines, mind you). The winery building is still standing in all its glory, but has been completely modernized inside and a large cellar has been constructed underneath. 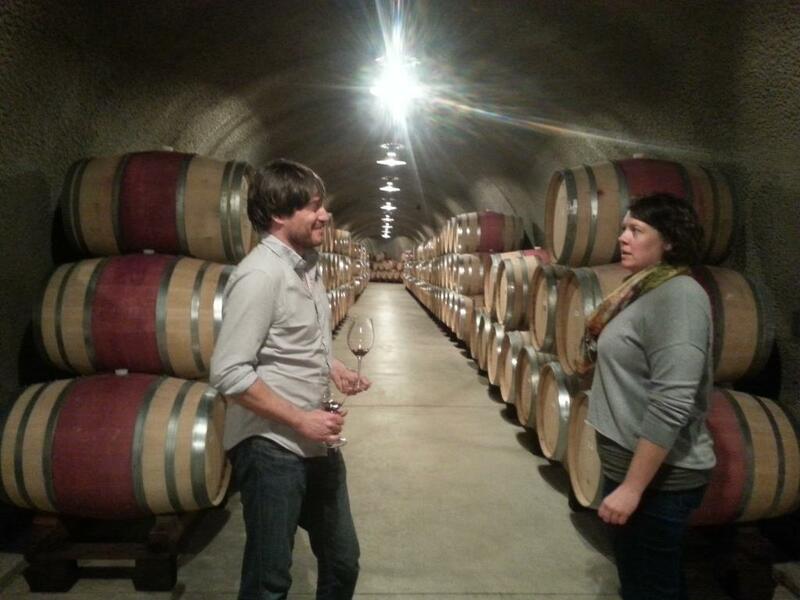 Ladera has been owned by its current owners Pat and Anne Stotesbery since 2000 and has built an impressive reputation for Cabernet Sauvignon. Everything was just so peaceful, you almost wanted to speak in a hush not disturb it. The tasting room manager during our visit, Julie, was friendly and knowledgeable and was happy to share with us the story and wines of Ladera. And we were ready to have both shared with us. Get what I mean about the sky? We started with a 2013 Ladera Sauvignon blanc, from what I can tell the winery’s only white wine ($30). And it was a great start: The nose was full and lush, with kiwi and gooseberry aromas, some flint, slight green pepper and bitter almonds, as well as beautiful hints of cassis (yes, I am a white wine person). It was bone dry, crisp and fresh, and oh so flavorful: grapefruit and other citrus in the forefront, cassis and blackberry, but also nicely creamy and almost doughy (in a good sense – it spent 7 months on lees!). I loved the balance of it, it was the right opening for a sunny day. I could drink that any time. On we went to the 2010 Ladera High Plateau, a mix of 98% Cabernet Sauvignon and 2% Petit Verdot ($65). The wine poured in a dark ruby red, and the nose was amazingly powerful, with what felt like many layers of blackberry, plums, cacao, and, to my surprise, what I can only describe as watermelon. I guess a hint of sweetness combined with freshness. Definitely unexpected. The wine was dry with medium tannins and body, and nicely crisp acidity. On the palate it was aromatic, with sage and brush (Julie mentioned later the vineyard is surrounded by evergreens), raspberry, mocha and bitter chocolate with a long finish. Count me as impressed: This was a Cabernet Sauvignon that made me understand why people can love that grape, which I am often ambivalent about: It had the right mix of fruit and spice, and presented itself very well. In between, we took a tour of the facility and state of the art cellar, probably one of the most beautiful modern cellars I have ever visited. And they have a great tasting room down there as well. The press and fermenting tanks are modern and lots of steel, it was quite pretty. In general, wines are fermented in open top vats with a cold soak for two to three days. From there, we went to the 2011 Ladera Howell Mountain Reserve Cab, a just released 100% Cabernet Sauvignon sourced from the winery’s best lots in Howell Mountain ($85). It poured in a similar dark ruby that the 2010 High Plateau poured in, but the nose was a lot more powerful: plums, but then a bunch of green peppercorns, tobacco, and some smoke with definitely more prominent wood aromas in the nose. To my surprise, the palate was definitely more fruity than the nose gave away: There was a bunch of black berries and cassis, but paired with a certain rubberiness that can be expected in such a young wine of this intensity. What I loved most about this wine was its texture, which was just beautifully chewy. The acidity and the tannins were in good balance, and the wine showed a lot of promise, although I want to try it in five years when it has calmed down a bit (as most of you know, I like my reds with some age on them). Finally, we got to try some of the 2011 Ladera Howell Mountain “S” Cabernet, another 100% Cabernet Sauvignon, but this one stemming from the one block in Howell Mountain with the oldest vines, and only the four best barrels of that. So just a teeny little amount available ($175). The wine poured in a very dark ruby, almost black. The nose was intriguing, but also a bit mystifying: some brush, some licorice, some red berries, but also a bit musty at this stage. On the palate, you could tell this is way too young right now, but it provided a nice little window into its development: It felt a bit all over the place and very intense right now. What I liked about it was its fruit and acidity with powerful tannins that need settling down. But that’s a great structure for development. The finish was great: dark chocolate for days with no end in sight. Want to try this again in seven to ten years. For me, this visit has the potential of being transformative. I never quite got why people could be so obsessed with Cabernet Sauvignon, which to me is often just powerful with no finesse. Ladera showed me that there is a different route for that grape, and it’s definitely worth exploring more. Needless to say, Nina knew that all along and had a great time as well. So, thanks to Ladera and thanks to Anatoli for opening my mind! Delheim Estate sits on land up in the hills that was first turned into agricultural land in the 1800s by Jan Andries, who purchased parcels of land over a 50 year period to create one farm. In 1938, Hans Otto Hoheisen bought the 200 hectares which he wanted to use as his retirement home. By 1940, he had decided on parcels of land that he wanted to cultivate vines on, cleared the scrub and got going. In 1951, the German nephew of the owners, Michael Sperling, also called Spatz Sperling (Spatz meaning sparrow, Sperling being a synonym for sparrow), joined the operation and worked at the winery for 60 years, establishing it as a leading winery in the region. The wine that made Spatz famous is his “Spatzendreck”, which was conceived in 1961 when he poured this newly developed wine (a sweet dessert wine with a brownish color) into the glass of a friend who exclaimed “Now, Spatz, this really is just ‘dreck'”, Dreck meaning dirt. Spatz’ sense of humor is expressed in the name of the wine, and he also created a hideous label that won Decanter’s prize for worst label of the year in 1970. The day we went to visit the winery, we met with its national sales manager Johan van Dyk in the winery’s restaurant which is located in the midst of its sprawling holdings. Johan explained to us that Delheim is particularly proud of its family-friendliness, which was not only shown by all sorts of certificates attesting it, but most vividly by the children’s birthday party that was held at another table in the restaurant: The kids were digging into the cupcakes served to them while the parents enjoyed a glass or two of wine. All this happened in a great, relaxed atmosphere. 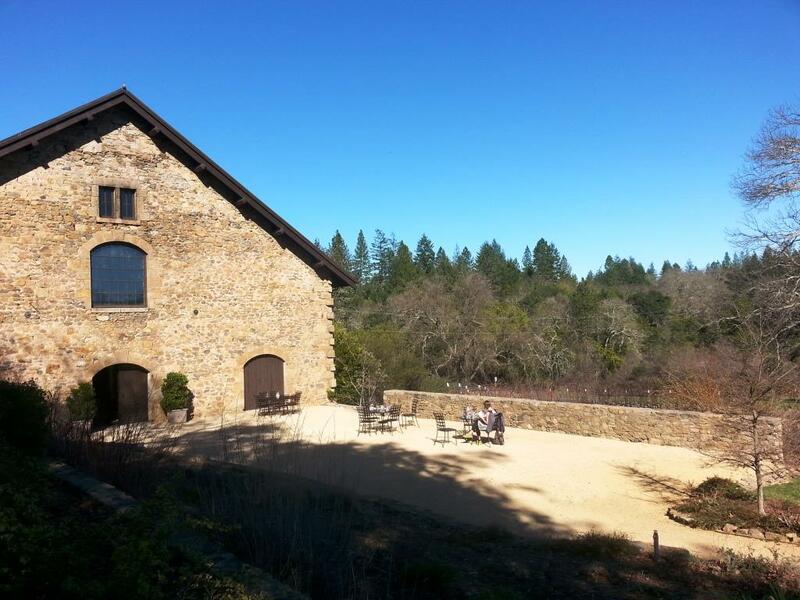 If you have kids, this is definitely your winery to visit first and foremost. I started lunch with the pancake pairing. The genius of this dish is that it comprises a starter, a main course and a dessert in three small portions of pancakes which were delicious. The menu starts with a salmon and cream cheese pancake, is followed by a lamb shank pancake and then crowned with a pickled butternut squash pancake for “dessert”. The pairings were the 2014 Pinotage Rose with the salmon, the 2012 Cabernet Sauvignon with the shank, and the 2013 Edelspatz dessert wine with the squash. The pairings really worked: The Pinotage Rose had some residual sugar with aromas of raspberry and strawberry as well as some cream and was very tasty with good acidity. Combined with the salmon pancake, it accentuated the salmon and its acidity cut through the cream cheese. We ended up taking a couple of bottles of the Rose because it was so tasty! I wish I could drink this every day on a sunny day. The Cabernet Sauvignon, which had aromas of cooked red fruit, some cinnamon and was mostly fruit-driven, was made even fruitier by the lamb shank which also brought out more vanilla aromas in the wine. I thought the Cabernet Sauvignon was very drinkable (which, as you know, is quite the statement by me!) and the pairing did work. Lastly, the Edelspatz with its strong aromas of canned peaches and apricot, was definitely enhanced by the butternut squash. The wine lacked some acidity for my taste and was too sweet tasting on its own. But combined with the pickled squash it was an eye opener: There were now aromas of nutmeg and cloves and the wine seemed way drier. Well done! After the pancake pairing, Delheim Estate served us a lunch (I know, I know…I did gain tons of weight on this trip). One thing I want to mention about the lunch is how accommodating Delheim’s kitchen was to Nina’s food allergies. The kitchen had not received the memo that contained information about her allergies and so was completely unprepared, but the chef immediately came to our table, discussed Nina’s needs and came up with a wonderful curry dish which she whipped up in no time. This is a commitment to service that is rare to find worldwide, but a defining feature of our time in Stellenbosch. 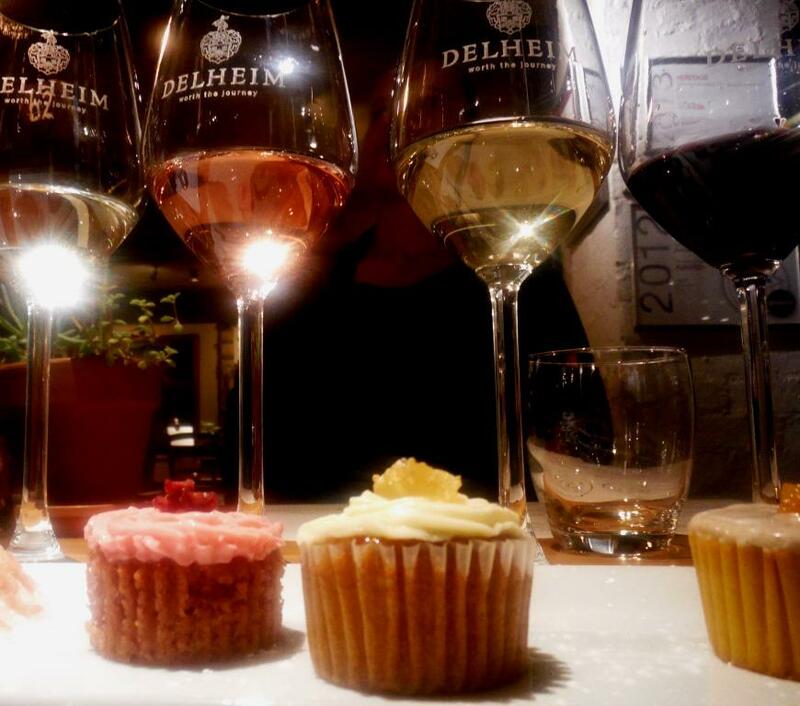 After lunch, it was time for the cupcake pairing, which pairs four cupcakes with four of Delheim’s wines. The cupcakes were a Roiboos (which is a South African tea) cupcake, a pomegranate cupcake, a Makataan (an African melon) cupcake, and a pumpkin cupcake. These cupcakes were paired with (in order) an unwooded Chardonnay, again the Pinotage Rose, a Chardonnay Sur Lie (a Chardonnay that spend time on the lees), and the winery’s Pinotage. 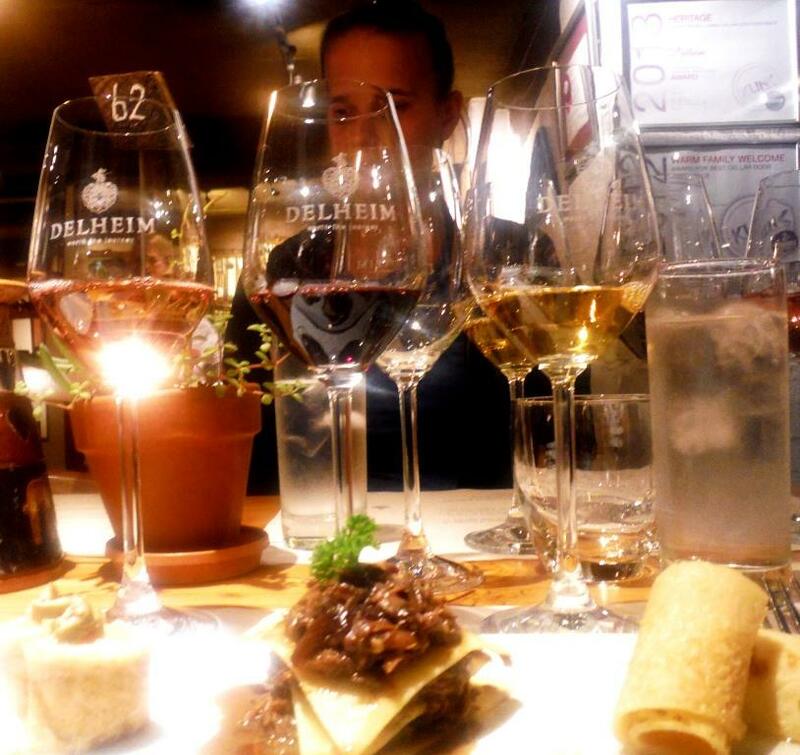 All in all, Delheim’s line up of wines is mostly fruit driven for easy and mostly early drinking. The wines were very tasty and also quite affordable. The pairings are 70 Rand (which is about $7), so definitely, go and try it out. Great fun, you learn about your tastebuds, you get surprised by what pairings actually are capable of, and you will enjoy the leisurely atmosphere. Make sure you make a reservation, though! The place was packed, despite this being low season. One of the things I love most about wines, is meeting the people behind them. Most of all, naturally, meeting the winemakers themselves. But there are more people involved in the wine trade than winemakers: importers, distributors, and retailers. Sometimes these guys are in it to our chagrin, when prices seem out of control due to middlemen and all sorts of weird dealings, but sometimes also to our delight, because it is these folks that enable us to get wines in the U.S. or elsewhere that are new on the international wine map, or are simply really hard to get. Enter #WineStudio, a series of Twitter tastings organized and hosted by Protocol Wine Studio. I have sung their praises in the past, but I need to reiterate this: I find it amazing what Tina and Guy have been pulling off there. An atmosphere of curiosity and total non-snobbiness, banter as well as enlightening conversation, even if you don’t have the actual wines to taste along. #WineStudio usually happens as a series of several Twitter meetings at 9pm ET on Tuesdays, and then there is the weekly changing #WineChat which is also worth checking out. I love the format of #WineStudio because it gives you a chance to dive deeper into a region or a portfolio, and since you do this over the course of several weeks, you really feel like you get a better grip on it (check out my awesome experience with Wine Studio XII which focused on lesser known German varietals). The wines we got taste and experience during the three sessions were provided by ZGR Imports, founded and run by mid-20s Jonathan Zeiger. 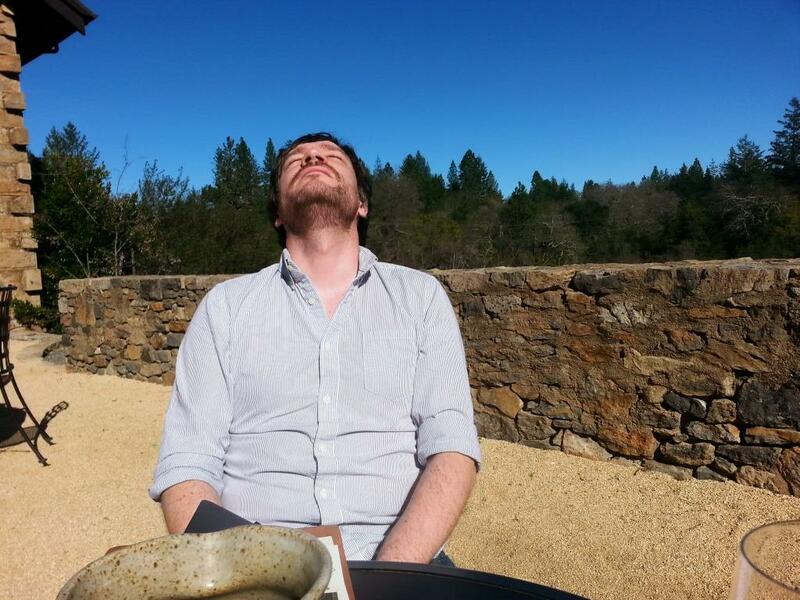 Jonathan embodies what I love about wine and people engaged in wine: Enthusiastic about the wines and regions he cares about, curious and always looking for new ways to share what he is fond of, engaging and personable, just a really, really likable guy. He pretty much stumbled on his business, when he was backpacking through Europe and hit up one of the wineries in Le Marche. When the owners, whom he befriended, told him they were looking for an importer, he started his own business…if that isn’t enthusiasm and can-do attitude, I don’t know what is. Check out his website, it’s pretty neat, you can buy his wines directly from him, and his story is even better told in his own words…Guy also did an interview with him that is worth your time (see here). Any distributor or importer that wants to show his portfolio faces the dilemma of how to present the wines: Do you want to do comparative tastings of wines made by the same grape, or do you want to focus on one producer in detail? Many things influence these decisions, and it is often an early indication if that person really knows what they are doing. When I received my tasting order sheet, I was scratching my head: Jonathan had selected to go with portfolio tastings, trying a Rosso Piceno and a Pecorino wine from one winery one week, and then the same wines from another winery. My gut was telling me I would have liked to try the Rosso Piceno wines against each other, and then the Pecorino wines. But as it turned out, Jonathan had done everything right: The winemaking styles of the two wineries were drastically different, so it would have been really difficult to compare the wines against each other…well done, Jonathan! We started with wines from the family-run winery Centanni, which is located in Montefiore dell’Aso. 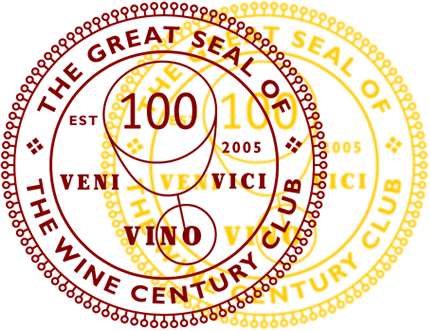 The winery is organically certified. The first wine started us off on an incredible trajectory: Centanni 2012 Offida Pecorino. The color was golden yellow, and the nose showed some rubbery aromas, but was quite fresh. I didn’t detect many aromas in the nose. On the palate however, this was a stunner: very fresh, aromas of pear, orange rinds, some cream with a spicy, and later even tickly finish. While the wine was heavier with its 13% ABV, the alcohol didn’t show itself as overbearing, mainly because of the great acidity. The nice thing about this wine was its play between heavy and light. I am usually not a big fan of higher alcohol whites, plus I am VERY partial to Rieslings, but this one did work for me. According to Jonathan, Italians say it’s a white that acts like a red, and that was so right. For many in the group, it was the first Pecorino they ever had, but I had tried one in Rome two summers ago. This one was miles better. Really strong showing and it retails for $29 (which I would consider a bit pricey). Next up was the Centanni 2012 Rosso di Forca which is from the Rosso Piceno DOC. Rosso Piceno is a unique blend of the region, consisting of Montepulciano d’Abruzzo and Sangiovese grapes. As it turns out, that is genius pairing: Montepulciano d’Abruzzo wines can be dark and brooding and spicy, while Sangiovese is lighter and less rustic. This representation of the blend (50% Sangiovese, 50% Montepulciano) really impressed me: The color was of a purplish red, and the nose showed mineralic and flower aromas, some wood, some liquorice. Really intriguing. On the palate, the wine was chewy, yet feeling quite light. There were cherry, some berry and vanilla aromas, also cedar wood and good tannins. The finish didn’t contain a hint of bitterness and was long lasting. While the wine contained enough fruit, it was more these forest aromas that impressed me. I returned to it again and again. Nina commented it combined the lightness of a Pinot Noir with the boldness of a Cabernet Sauvignon…for $17, this is a steal. The following week, we tried the wines from Rio Maggio, located in the heart of Le Marche in Montegranaro. The winery was founded by Graziano Santucci in 1976 and his son Simone took over operations in 1996 when his father passed away. Next up was the Rio Maggio Contrada Vallone 2010, their Rosso Piceno. The color of this wine was dark, with slight brick color. On the nose I got an awesome combination of rhubarb pie, plum, green tea and some mushroom aromas. WHAT A NOSE!! I just didn’t want to withdraw my nose from the glass. Really weird combination, but I LOVED it. On the palate, this wine showed rather strong wood aromas and was quite restrained, almost austere. There was good acidity, but the tannins threw it a bit off for me and it felt like the alcohol was a bit out of control. But as you know, I am quite sensitive to this. Most other tasters had no issues with this. Retail: $24. I will be spending a few days in Le Marche in July, and am already giddy with excitement!